Our smile can deteriorate over time, often due to our genetics, natural course of aging, an unfortunate accident or damage from eating or drinking habits which can result in smiles that are less than perfect. While it can be difficult to repair on your own, it’s sometimes best to consult a dentist about your options to revitalize your smile. At Dr. Vanathy Jeeva & Associates we strive to provide our patients with cosmetic dental treatment of the highest quality that is at a reasonable fee. We believe that everybody deserves to have access to dental services to improve your smile and happiness. If you’re looking for the right team to help you achieve the smile you have always wanted, trust our team to get it done. Cosmetic bonding is an affordable option for repairing a broken tooth, filling gaps or eliminating spots, chips or discolourations or uneven tooth shape. This tooth-colored material can easily be bonded to your teeth in a quick and easy procedure by your dentist to give immediate satisfying results. Cosmetic bonding is a great options for patients that are dissatisfied with the color and/or shape of your teeth but are not ready to pursue veneers or crowns just yet. Consult with the dentist if this option is ideal for you. Componeers are a new class of veneers that are prefabricated composite veneers, which combine the advantages of direct composite restoration with those of lab-made Veneers. These enamel shells are a thin veneer coating that have a shiny and naturally designed surface ideal for anterior teeth restoration. Patients can be given a naturally aesthetic smile in just a single session. Porcelain veneers are one of the most popular treatments for patients seeking to enhance the appearance of their smile if you are self-conscious about your teeth due chipped or “short” teeth, discoloration, spacing issues, or other concerns, you may not feel comfortable smiling. Our dentists will ensure a custom color that will match your teeth perfectly to give you that perfect and long lasting smile. Over time your smile can become discoloured from different foods and drinks including, coffee, tea, wine, and pop. Tobacco can also discolour your teeth. Before the whitening procedure it is highly recommended that you have your teeth professionally cleaned and a proper oral exam is administered. This will ensure that all cavities and other oral health issues are taken care of before the whitening procedure. Call our office to discuss the various options that is best for you. If you are concerned about your old amalgam fillings and are unhappy with the look of them, book an appointment to have the old fillings assessed by our dentists. 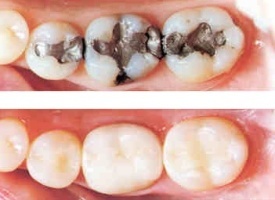 We can change your aged and unpleasant looking amalgam silver fillings to white composite. They are not visible and cosmetically pleasing to the eye.